A new permissive pathway through Derwen College. For many years the local people of Gobowen and visitors to the Orthopaedic Hospital, who are seeking a shorter walk from the railway station, have used the permissive pathway route through the centre of Derwen College. The route from Whittington Road to Twmpath Lane has been a popular short cut for pedestrians, dog walkers and cyclists. This has resulted in a steady stream of people through the centre of the College campus at all times of the day and night which has always been a concern for the College Safeguarding Team throughout the years. Local residents may not be aware but this is not a public right of way – we completely close the College and all entrance gates twice a year at Easter and at Christmas to protect this private status. 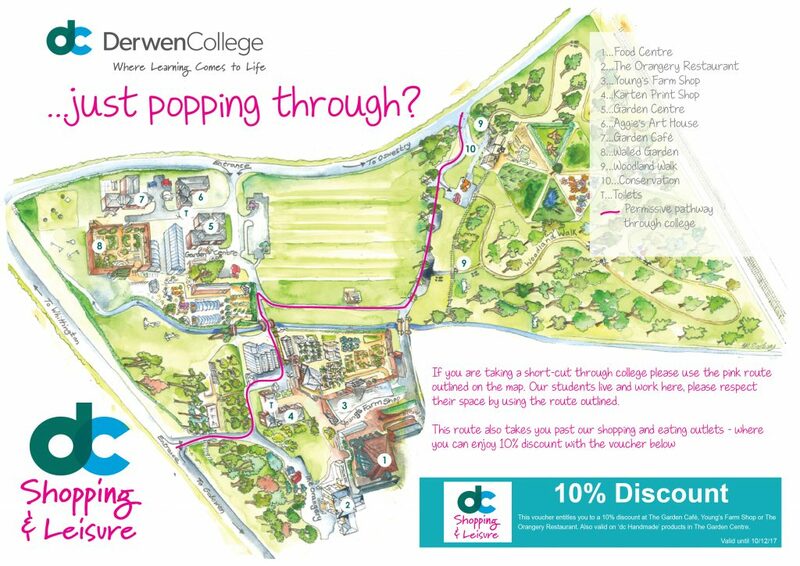 Over the years, the majority of persons using the route through the College have appreciated the short cut and have respected the vulnerability of the young people who are students at Derwen College. There have, however been concerns for the safety of our students and trainees from some dog owners, cyclists and pedestrians using the route through the centre of the College. Cyclists in particular create a real danger to our students whose mobility and sensory awareness is often impaired. We are aware of the potential inconvenience to the local community in restricting access through the campus and we do not intend to do so. To address this issue a new Permissive Footpath route for pedestrians has been developed. This will give pedestrian access through the Orangery Restaurant, through the commercial areas, over the bridge, along the football field and out via the gate on Twmpath Lane. The only public right of way on the college campus is a public footpath from the gate by the bowling green along by the football pitch, through the Woodland Walk near the stream and exiting the campus over the stile to the railway line. The footpath then continues behind Meadowbrook and the Orthopaedic to the main road. The access to the railway line also causes a great concern and we have liaised with Network Rail and others to address this. There are large costs involved with re-routing a public Right of Way, both administrative and material and these have prohibited this change. The Parish Council did approve the proposed diversion in December 2013. These plans have been discussed with the Parish Council , five of whom attended a recent site visit and the vulnerability of our students and trainees and the obvious safeguarding issues that the current situation presents were observed and appreciated. We have also been in contact with Orthopaedic Hospital staff who also appreciate the issues we are facing and have welcomed the alternative footpath that we are providing.